So, I'm not sure how I didn't know about the blog Fara7 al-Kiameh until just now, but it's a wonderful resource for (Arabic-language) info about MJO activities and general Orthodox life in Lebanon. Lots of pictures! 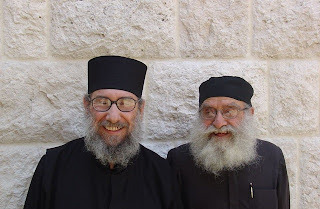 One day, the monks Elias Morcos and Touma Bitar met, and it is a rare thing for two such spiritual peaks to meet. One of the young people wanted to take a picture of this distinguished meeting. He set the picture up with everyone smiling, but Father Elias was grumbling to himself. The photographer asked them not to move in order to get the picture right. He noticed that Father Elias was complaining, so he asked him what the reason was. 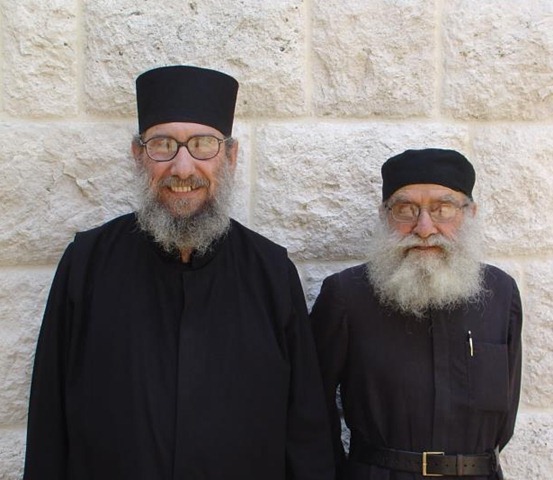 Father Elias replied, "How can you frame the picture right when you're standing in front of two people with completely opposite heights? The first one is rising up and the second is going down." The two fathers laughed, and Father Touma bent down a little bit so that their heights would even out. Everyone was cracking up, and if the photo could talk, it would tell the story of a funny stance and two monks who are not bothered by shortness or height because they are great in the presence of God... but through contrition and humility.